Our customers appreciate that we only specialize in proven materials that create beautiful and durable decks for Georgia and Atlanta area residents. These natural hardwood decks are enjoyed all year round and don't require constant upkeep. They also have the benefit of being extremely affordable when compared to higher cost composites. 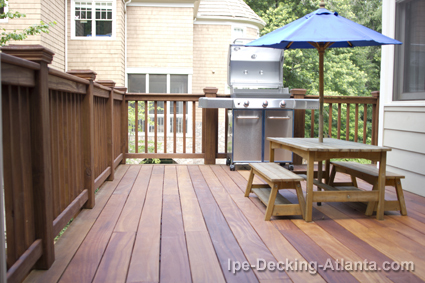 An Atlanta deck made of hardwood far outperforms pressure-treated decking. Choosing natural hardwoods over treated decking is also a sound choice because the hardwoods we sell are free of poisonous chemicals. If you don't like the color of ipe, no worries. We are direct importers of 100% solid hardwood decking materials including Ipe, Tigerwood, Cumaru & Garapa. You can call us directly, Monday through Saturday from 8:30 AM to 8 PM EST. In addition to custom orders, we also carry deck tools & accessories. Currently we ship to Atlanta GA from our next closest national distribution warehouses. We also offer our convenient decking quote form.